Abrupt and massive expansion of the childhood vaccine schedule: In the U.S., the schedule went from three recommended vaccines in the mid-1980s to fifteen different vaccines currently. Changes in vaccine technology: Changes include production of recombinant (genetically engineered) vaccines and conjugate vaccines (which couple a weak vaccine antigen to a protein carrier), both of which actively go after “immunologic memory” and non-antibody immune response. A study conducted in 2012 and published in 2017 in the Journal of Translational Science compared chronic health problems in vaccinated and unvaccinated 6-to-12-year-olds—in other words, children born between 2000 and 2006. The results lend credence to Fraser’s thinking about vaccination and allergy trends. Among many striking results, the authors found that vaccinated children had a significantly greater odds of having a diagnosed allergic condition compared to unvaccinated children: 10.4% versus 0.4% for allergic rhinitis, 22.2% versus 6.9% for “other” allergies and 9.5% versus 3.6% for eczema and other forms of atopic dermatitis. Other studies also have linked vaccines to atopic conditions and allergic sensitization. Fraser elegantly connects vaccines to this view of allergy as an evolved immunological response to toxins. She and other writers have pointed out that awareness of the association between injected toxins and allergic reactions goes back to at least the early 20th century, when a French physiologist coined the term “anaphylaxis” to describe what happened to a dog injected twice with a hive-inducing marine toxin; the dog died within minutes of the second injection, administered three weeks after the first. Later, a 1940s study described how tetanus vaccine could induce allergy in humans. 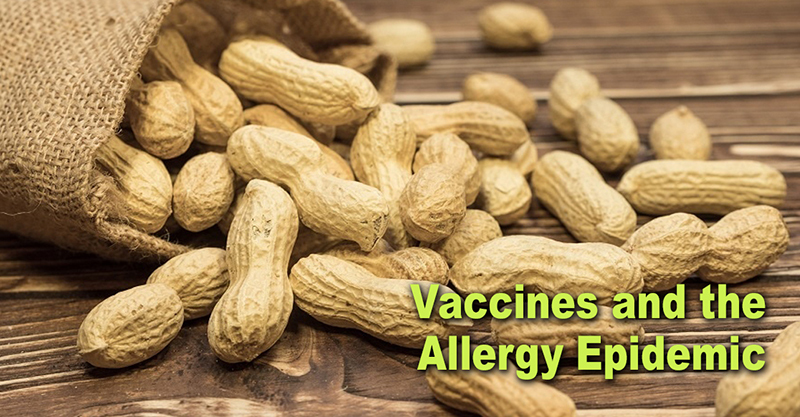 In fact, the medical literature is replete with terms such as “bystander effects” and vaccine-induced allergic responses to “non-target antigens,” all of which describe vaccines’ almost guaranteed ability to produce unwanted immunogenicity in the form of allergy. Notwithstanding the fact that vaccines also contain a plethora of worrisome ingredients—“immunogens, preservatives, adjuvants, antibiotics and manufacturing by-products” in addition to carrier proteins and live or inactivated viruses and toxins—Fraser believes that vaccines’ skewing of the immune system as a whole is the most significant contributor to subsequent allergy.